The French Toast my mother makes is so good !! And you may think, well, like all mothers ... but these are so good, you cannot stop eating them !! :-) I remember when I was younger, my family used to pair the French Toast with a glass of Anise or sweet Sherry wine while waiting for the Holy Week (Semana Santa) processions to pass by the front of our house where we used to live some years ago. So now, the perfect combination :-) But before sharing her recipe, and as we’re used to doing, we are going to tell you a bit about the history of this rich sweet. As we have learned on the Internet, French Toast is a food of humble origins that quickly satisfied the diner’s hunger and its use was, and is, customary during the season of Lent, when Catholics stop eating meat. The French Toast (Torrija) or “Torreja” is first documented in the fifteenth century, as quoted by Juan del Encina: "honey and a lot of eggs to make French Toast", apparently as a dish suitable for the recovery of those who just gave birth. The first recipes date back to Domingo Hernández de Maceras’s Cookbook (1607) and Francisco Martinez Motiño’s (1611) Art of the Kitchen, Pastries, Cakes and Canning. The toast was very common in the early twentieth century in Madrid’s taverns and were served with wine in short, wide wine glasses. Its association with Lent is perhaps due to the need to use leftover bread that during the time in which they could not eat meat, at the same time also ate less bread, even though families still baked the same amount. What did they do with the extra bread? They made Torrijas !! :-) Here is her recipe and, we hope you like it very much. We promise you that if you prepare this recipe following each easy step, yours are going to be just as delicious :-) We hope you enjoy them very much. * To start with we are going to heat the milk, together with the skin of the orange and the cinnamon sticks. When it is warm, we will remove the orange and cinnamon and we are going to pour the milk into a bowl, where we will add the wine and sugar, then stir. * Then soak the bread slices in this mixture until they absorb the milk and are nice and wet. * Then let the moistened bread rest on a cloth on a flat surface (table, counter, etc.). * Meanwhile, we are going to beat the eggs in another bowl. * And then will dip the bread slices in the beaten eggs and then we are going to fry them in oil on Med heat (Not too hot), turning them as needed to get a golden brown color on both sides. * We place them in a colander to drain the oil or on a tray with paper towels and set aside. * We prepare the honey by heating it in a pan along with the water, and once it comes to a boil, dredge both sides of the French Toast in this honey. * And then we’ll arrange them on a serving tray. 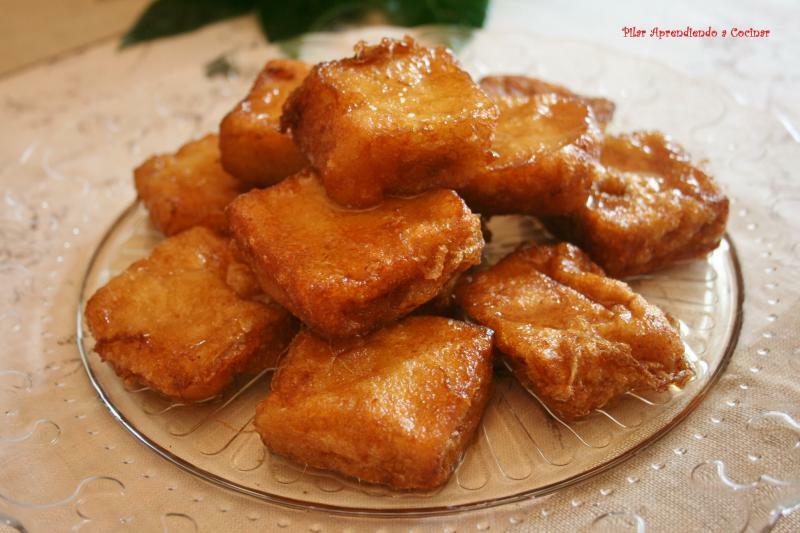 And ready to enjoy this tasty “Torrijas” French Toasts, for breakfast, with the tea or coffee, for dessert ... ! You can have them anytime because the truth is that they are very tasty at any time of the day. Have a great day and enjoy our Holy Week (Semana Santa), it is just round the corner !